Difficulty in opening or closing mouth, deviation of chin on opening and closing. Mandible - considered to be a long bone bent in the middle and articulating with the skull via the temporomandibular joints. This arrangement means that there are natural points of weakness. Palpation - steps along mandibular border, localised tenderness, tenderness and lack of movement of the mandibular condyles, anaesthesia over the distribution of the mental nerve. Reduce by placing thumbs (wrapped in gauze) in retromolar fossa each side and fingers over chin. Get patient to relax - diazemuls if necessary. Press thumbs down and back and fingers upwards. Institute medical management before transfer. The maxilla is a complex bone made up of strong buttresses but with areas of weakness around the maxillary sinus. 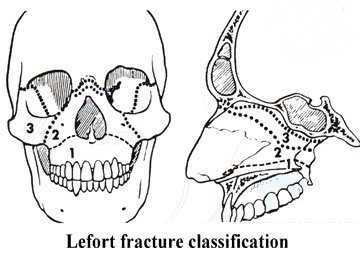 Combinations occur and fractures are often comminuted. Enophthalmos and diplopia are early signs + "blackeye". Later, tethering of the inf rectus (or medial rectus) muscle - inability to look upwards on the affected side. Traumatic diplopia in children is a medical emergency. An ocular muscle may be caught in a "trapdoor" orbital fracture (usually inferior or medical wall) and requires emergency decompression to prevent ischaemia. Blindness or visual symptoms are early warnings of a retro-orbital haematoma. Retro-orbital haematoma is a medical emergency. Please discuss with your Plastics Reg or your Consultant before imaging (most imaging not necessary - requires immediate decompression). Mx most orbital fractures >10mm (even if undisplaced) is surgical (prevent late enophthalmus). Neurological deficit - seek neurosurgical advice. Clinical Dx - do NOT x-ray unless a FB is suspected. There is no evidence for early manipulation of nasal fractures [BestBets]. Immediate referral to plastics SHO at CUH (discuss ENT review first). For visitors from Dublin, who must unfortunately leave Cork (against all logic or desire), the St. James Hospital referral form sould be completed.